Written by Matthew Healey – Department of Chemistry, Loughborough University. The UK has a strong Science Technology Engineering and Mathematical (STEM) heritage. It is home to four of the top ten universities in the world, it has the most Nobel Laureates outside the USA, and it is second only to Germany when it comes to participation in EU research projects. Therefore, nurturing research and innovation in UK universities (such as Loughborough), specialist institutions, and innovation incubators is critical in terms of protecting our high value manufacturing economy. Rarely do we see ‘Made in the UK’ on a pair of socks, but we are well-known for our advances in research, design and manufacturing (trains and jet engines are just two of many examples that immediately spring to mind). You may be wondering what this event was – well – it was ‘STEM for Britain’; a major scientific competition and exhibition in Parliament that was originally set up in 1997 by the late Dr Eric Wharton. The aim of ‘STEM for Britain’ is to support, encourage and promote those who are in the early stages of their STEM research careers. Essentially, it’s an event that provides an excellent forum for researchers to discuss their work with both Houses of Parliament whilst also fostering engagement with the R&D community. Selection to present at ‘STEM for Britain’ was tough! According to the call of interest, each year there are around 500 entrants with only 35% being selected to present! Undeterred, I wrote my abstract for a non-specialist audience and explained why my research is considered ‘ground-breaking’. Then, I waited… After what seemed like a life-time, I received an email to say I was accepted! My initial reaction was absolute delight and then the excitement and nerves set in – I had seven weeks to prepare! In March, the day of the event arrived and, so did I, at Portcullis House. After waiting outside with numerous others to pass through the tight security (it was akin to that in an airport! ), I was finally let in and directed to the event space. The large wood panelled room was full of people and some of the best posters I’ve seen! Eventually I found my allocated display board, pinned up my poster and eagerly awaited viewers. Although the event was held in the Houses of Parliament, the atmosphere felt relaxed with a real buzz in the air. Having taken in the ambience and the excellent catering, I started to talk to the presenters around me and I was amazed how varied the research was; from energy generation to applied mathematics. There was vast representation of UK research from many of the UK’s universities and at that moment I felt the absolute honour to be there representing Loughborough at this prestigious event. With judging over it was time to relax and take in more of the atmosphere, and meet some MPs from over the UK. 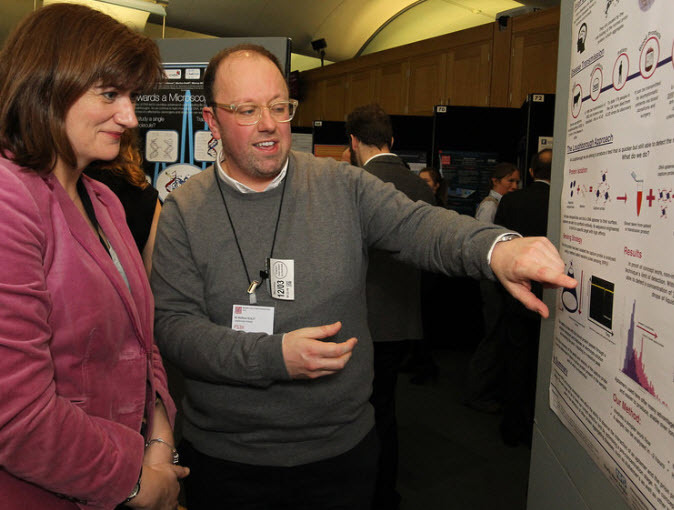 Nicky Morgan (the local MP for Loughborough and prior Secretary of State for Education and Minister for Women and Equalities) was the first to stop by, followed a little later by my home MP Nigel Mills; both of whom were very receptive, and engaged with my research, asking some very probing questions. It was such a privilege to have what seemed meaningful conversation with policy makers. From a personal perspective, it often appears that MPs base their decisions regarding research funding allocations on the facts and figure that they are given. Therefore, ‘STEM for Britain’ provided numerous early stage researchers with that once in a lifetime experience to take share their work in the home of the UK Government, some of which is funded by Government initiatives. On reflection, although I didn’t win the competition, I will always be able to say I was selected from many hundreds of other researchers throughout the UK to present at this unique event. I also took away some invaluable feedback on my work and several new contact details! Matt Cook on Today I graduated…. Lizzie Gadd on Today I graduated…. Jane Secker on Today I graduated….